A new video clip posted on YouTube by Aatma Studios has racked up a cool 5 million views, showing off the features of a futuristic iPhone 5 concept phone. 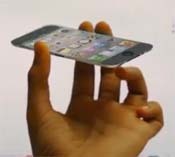 The clip shows an ultra-thin form-factor, a laser-keyboard and Minority Report inspired holographic projector. While the final specs have not yet been released by Apple, the iPhone 5 is widely rumored to have a larger screen, faster processor, thinner body and a beefed up 8MP camera. We’ll have to wait for the lasers.